It’s important to stay active. Residents of Asbury Heights have access to our Fitness Center 24 hours a day, seven days a week. Complete with cardiovascular and strength-training equipment designed specifically for older adults, our Fitness Center accommodates individual and group fitness programming. Overseen by Symbria Rehab, our SeniorFITness program fosters independence, functionality and strength for as long as possible. Circuits are done with specially trained staff nearby to offer one-on-one assistance and feedback, which ensures user safety and positive results. Because SeniorFITness is a results-based program, outcomes are tracked so participants can monitor their progress. For those who prefer them, a variety of group exercise programs are available. The classes below take place in the our Fitness Suite. 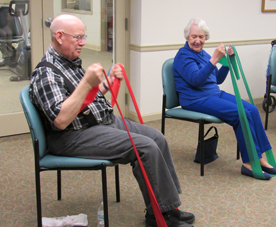 Residents improve their balance through use of exercise bands, seated and standing exercises and a short self-paced walk! Class ends with a cool down and stretching to get you ready for the rest of your day. This class focuses on improving balance, range of motion and flexibility while incorporating seated yoga poses, stretches and standing exercises. Residents who want to improve their balance or feel relief from stiff muscles and joints are encouraged to join. This class is ideal for those who have arthritis. We focus on reducing stiffness through a variety of hand exercises, gentle seated/standing strength exercises and supported balance poses. This class focuses on strengthening your whole body using exercise bands, weights and much more! The exercises used in this class target functional movements we use every day such as getting up from a chair and reaching for items in the kitchen. Stations are set up with a variety of exercises to get residents moving from head to toe. Weights, exercise bands, balls, balance bars and more will be incorporated into this class.